FILE - A man sits as others stand near the wrapped up bodies of children from the same family, one day after they were killed in a Saudi-led airstrike on their house in Bajil district of the Red Sea province of Houdieda, Yemen, Oct. 8, 2016. A network of organizations seeking to protect children in conflict urged U.N. Secretary-General Antonio Guterres on Wednesday to add 11 parties to the blacklist of countries and armed groups responsible for grave violations against children. The Watchlist on Children and Armed Conflict's recommended additions included the Saudi Arabia-led coalition in Yemen, which was taken off last year's list by then-Secretary-General Ban Ki-moon after the Saudis and their supporters threatened to stop funding many United Nations programs. Watchlist also called for the adding of the Israel Defense Forces, which were kept off the 2015 list after lobbying by the United States and the Israeli government. The network said the Israeli military should be added for killing and injuring children and attacking schools and hospitals in Gaza and the West Bank. 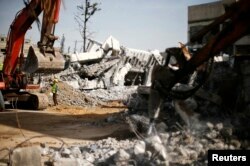 FILE - Palestinian workers clear the rubble of a school that witnesses said was destroyed by Israeli shelling in the east of Gaza City, Dec. 3, 2014. The U.N. chief's annual report on children and armed conflict, which contains the blacklist, is usually released in May or June. The June 2016 report initially named nine governmental security forces and 51 armed groups that committed grave violations against children in 2015. "The new secretary-general has an opportunity to send a clear message to all member states that a party to conflict is listed for one reason alone — a pattern of documented, U.N. verified evidence of grave violations against children," Watchlist advocacy officer Dragica Mikavica said in a statement. Watchlist, a human rights and humanitarian network established in 2001, also recommended the listing of armed opposition groups in southern Thailand for perpetrating attacks on schools and hospitals, the Communist Party/Maoist for recruiting and using children in India, and the Afghan National Defense and Security Forces and pro-government militias in Afghanistan for recruiting, killing and injuring youngsters. Other groups the network cited for addition to the blacklist are the Popular Mobilization Forces in Iraq; the Libyan National Army and several other armed groups in Libya; Johnson Olony's armed group in South Sudan; Tehrik-i-Taliban in Pakistan, also known as the Pakistani Taliban; and the Mali government-allied group GATIA and a coalition called the Coordination of Azawad Movements, which includes ethnic Arabs and Tuaregs and seeks autonomy in Mali's north. Watchlist urged the U.N. to collect further information on groups in Afghanistan, Congo, Iraq, Somalia, Syria, Philippines, Burundi and Ukraine and on two Palestinian groups — the Popular Front for the Liberation of Palestine and Hamas' military wing — for possible inclusion in next year's report.